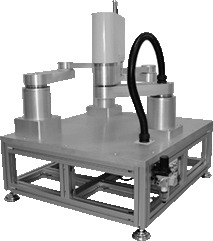 GPM series of redundant parallel robots is a new experiment and research system specially designed and developed by Googol Technology for research of redundant parallel robot. GPM can be used in robotics courses such as automation control and mechatronics to support laboratory experiment requirements in robot mechanism, kinematics, dynamics, motion planning and programming. This system can also be used in research of controlling and programming of redundant parallel robot, as well as a non-linear system with three inputs and two outputs, to research various nonlinear control algorithms and redundancy coordination control algorithms, assisting the control experiments of various automatic control theories. Besides teaching and research GPM series of parallel robots can also be used in developing new principles and experiment prototypes of high-speed, high-accuracy gluing and bonding machines. Special plane joint structure design to maximize the workspace of end effecter. Aluminum alloy connecting bars l, with unique structure design, lightweight, low inertia and high rigidity. Three-motor drive enables 2 DOF of the end effecter. All drive motors are mounted on the base to allow higher acceleration of the end effecter. Industrial grade AC servo motor equipped with absolute encoder and harmonic decelerator l are used to ensure high quality and reliability,, simple and compact structure, and high motion precision. High-performance motion controller in the control system, to facilitate the users in subsequent development and research on coordinated control algorithms.